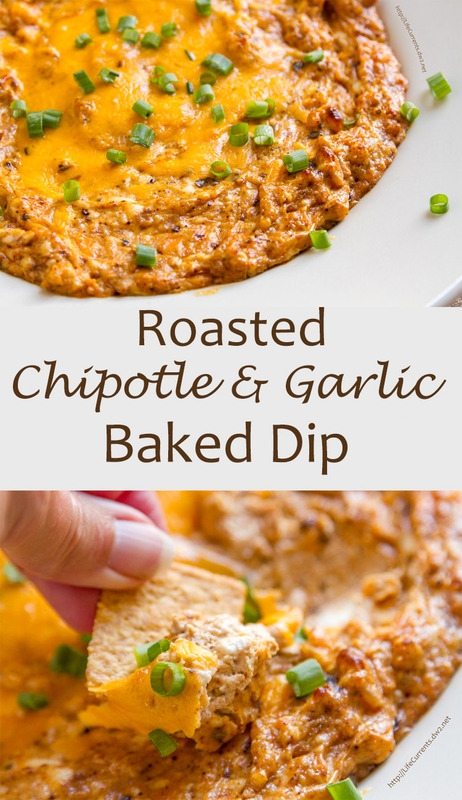 Roasted Chipotle & Garlic Baked Dip – cheesy and hot from the oven – this dip is so good. You are going to want to make this for your next party! And, it’s the next recipe I have for Tailgating Snacks Month! Can I just say that I really love this dip. Maybe too much (I ate like half the batch all by myself)! It’s super easy to make, and hot from the oven it’s like pure comfort goodness! Whether you serve it with crackers, bread sticks, French bread, or veggies, everyone will love this! I made mine with this Chipotle Chile Seasoning (that’s my Amazon affiliate link which if you buy something I’ll get a small percentage but it won’t cost you any extra). If you already have a Chipotle Spice or powder, feel free to use it. The one that I used isn’t too hot, so keep the spice level in mind for this dip. The cheese will help cut some of the heat from the chipotles. And, personally, I like a little tingly-ness in many of my dishes. Preheat oven to 350° F. In a large bowl or the bowl of a stand mixer combine all ingredients, reserving some cheddar cheese to sprinkle on top. Transfer dip to an ovenproof baking dish, and bake uncovered 15 minutes. Carefully remove dish from oven, sprinkle reserved cheddar over the top and bake for an additional 5 minutes, or until hot and melty. Garnish with green onion or chives, if desired. Serve with crackers, bread, bread sticks, or veggies. I often see serving size for sauces and dips at 2 tablespoons per serving, so that's the breakdown I used. But, I'm pretty sure I could eat WAY more than that in one sitting! Your photos and dip recipe look and sound amazing. I’m thinking that the number of portions I would eat would force me to use celery as a dipper- lol. Thanks! Going to try this one. Is it bad that I want to face plant into that incredibly delicious looking dip! I love a baked cheesy dip like this, but for me its definitely one for special occasions… or I’ll just eat it all in one sitting! I always love trying new dips, and as I’m a huge fan of chipotle I will definitely give this a go! This looks so good with the Chipotle and garlic! Yum. I am having a dinner party soon. I will be making this! Oh yum, this sounds so good! I am having huge cravings for a cheesy dip now – so good! I love dips and chips… not at parties but on weekends in front of the tv… this looks like a delicious option! Wow, so much flavor. This looks incredible!